The LUNA-FL™ Dual Fluorescence Cell Counter from Logos Biosystems is a quantum leap forward for automated cell counting and cell viability analysis. The LUNA-FL™ Dual Fluorescence Cell Counter gives you sensitive and accurate live/dead counts without cell type restrictions. Unlike immortalized cell lines, primary cells such as PBMCs, splenocytes, neutrophils, and stem cells have been difficult to count with conventional cell counters such as the Coulter counter or automated image-based cell counters utilizing bright field optics. Primary cells are often contaminated with undesirable debris that can be miscounted as cells with conventional cell counters. The LUNA-FL™ is equipped with dual fluorescence optics to overcome this problem. Live and dead cells are stained with green and red fluorescence dye, respectively, and subsequent cell images are analyzed with accurate image analyzing software (to read a general review of fluorescence cell counting, click here). Although the LUNA-FL™ can detect and count unstained cells, viability information can only be obtained from stained cell solutions. The traditional trypan blue can be used with the LUNA-FL™, as well as the safer Erythrosin B. Both dyes produce consistently accurate cell count and viability data with the LUNA-FL™. Left: A comparison of viability data using Trypan Blue and Erythrosin B. Right: Viability data using Erythrosin B with the LUNA-II, LUNA, and LUNA-FL. With the LUNA-FL™ Dual Fluorescence Cell Counter, GFP expression analysis takes less than 30 seconds. Bright field and fluorescence cell images are analyzed to detect GFP-positive and negative cells, and a corresponding fluorescence intensity histogram is displayed for further analysis. The LUNA-FL™ Dual Fluorescence Cell Counter is integrated with on-board flow cytometry type gating software. Be confident in the accuracy of your results by adjusting the threshold of fluorescence intensity. Once the LUNA-FL™ has counted your cells, you can check to see which cells were judged to be live or dead on the touch screen. Green and red circles indicate live and dead cells, respectively. Cells can be gated based on cell size. you can easily exclude or include the particles by simply dragging the ends of the histogram that graphically shows live and dead cell populations. The analyzed images from each channel (bright field, green, and red) can easily be merged directly on the screen. The brightness of each color can be adjusted for accurate monitoring. These images can be saved to an external USB drive for your records and further analysis. The analyzed data can be saved as a CSV file or a more detailed PDF report. Counting results, cell image data, and a various histograms are combined into a single PDF file and saved to an external USB drive. 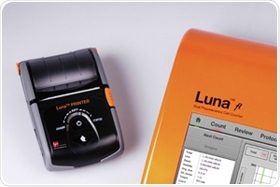 LUNA-FL™ provides a compact mobile printer for further record keeping purpose. Thermal roll paper or label paper can be selected. This plug & play mobile printer is ready-to-use after the USB to USB connection. Automated cell counters utilize disposable counting slide to eliminate washing steps of manual cell counting with glass hemocytometer. Logos Biosystems has developed innovative T-Bond technology (patented) to manufacture the precision cell counting slides more efficiently. The unit price of slide is almost half of the other brands, saving cost for heavy users.